The dimensions of the marked Blue Badge bays are 400cm x 560cm (13ft 1in x 18ft 4in). On street Blue Badge parking is located in Granville Street outside the main entrance. The dimensions of the standard marked parking bays are 260cm x 560cm (8ft 6in x 18ft 4in). 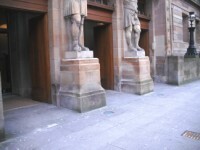 Standard marked parking bays are located in Granville Street outside the main entrance. 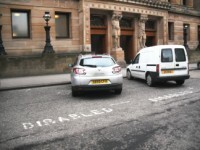 The photograph shows the Blue Badge parking in Granville Street. This information is for the entrance located on Granville Street. The width of the ramp or slope is 165cm (5ft 5in). 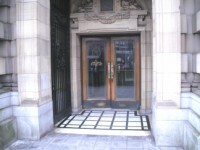 The 1st set of doors are always held open during opening hours. This information is for the entrance located on North Street. This entrance gives access to the Link Corridor on the 1st floor. 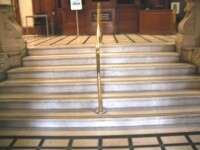 There are 5 medium, clearly marked, steps for access to the Simpson Conference Room on the ground floor. There is an easy slope (width 250cm) in the Link Corridor on the 1st floor. 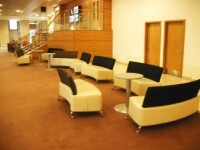 The hearing loop systems are situated in the Theatre, Learning Centre and the Conference Suites. 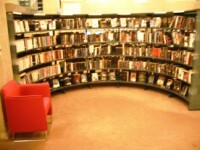 You are on Reception (Library - Ground Floor). Skip to the next section. 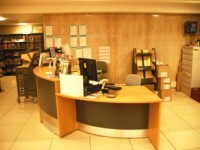 The reception desk is 40m (44yd) from the front entrance. This library does have a regular supply of books in Braille. You are on Restaurant Bar Internal (The Herald Café). Skip to the next section. The type of food served here is traditional light meals and snacks. 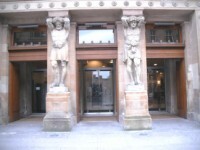 The Herald Café is situated on the ground floor. It is necessary to request table menus at the counter. 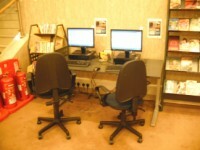 There is an Internet Café facility adjacent to the Herald Café. Companions sit next to or behind the patron. To borrow a wheelchair,at reception. 5 - Arts, History, Literature and a Conference Suite. 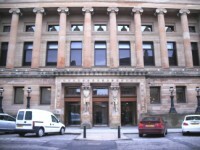 The lift is located adjacent to the Herald Café and the Library. 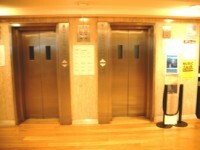 The floors which are accessible by this lift are G-5. The lift is 35m (38yd) from accessible entrance. The dimensions of the lift are 110cm x 135cm (3ft 7in x 4ft 5in). You are on Accessible Toilet (Theatre). Skip to the next section. This accessible toilet is located adjacent to the auditorium. The dimensions of the accessible toilet are 110cm x 170cm (3ft 7in x 5ft 7in). This accessible toilet is located adjacent to the Herald Café and the Library. The dimensions of the accessible toilet are 180cm x 180cm (5ft 11in x 5ft 11in). 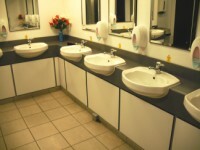 There is an additional accessible toilet situated adjacent to the standard female toilet. There is also an accessible toilet in the Link Corridor on the 1st floor. 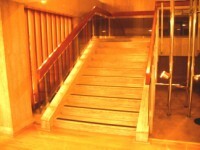 There are additional, level access, standard toilets on floors 2 to 5. The female toilet facilities that were surveyed are located in the reception foyer. The female toilet(s) is/are approximately 18m (19yd 2ft) from the accessible entrance. The male toilet facilities that were surveyed are located adjacent to the main entrance. 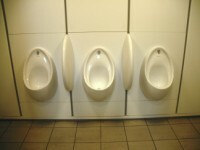 The male toilet(s) is/are approximately 2m (2yd 7in) from the accessible entrance. Accessible IT facilities are available in the Learning Centre. There are two wheelchairs available to borrow, please contact the information desk.